Are PC and mobile unfriendly to indies? The barriers to entry on PC and mobile may be lower than on consoles, but Cellar Door Games' Kenny and Teddy Lee think they're actually less indie developer-friendly, the pair told GamesIndustry International in an interview this week. In the five-year history of Toronto-based Cellar Door, the brothers have worked in all three markets. Their journey through the industry began with Flash games and the viral success Don't S*** Your Pants, in which players attempt to dutifully obey the game's lone imperative. "That sort of inflated our egos and we thought, 'Oh hey, game development is easy!' And from there we failed a few times," Kenny said. Their next stop was the fledgling iOS market, where they created two titles: one a free-to-play falling block puzzle game where players made lines disappear, and the other a $0.99 reflex game where players had to tap on a crowded field of items in numerical order as fast as possible. Both games flopped. "I think mobile is mainly geared toward the multimillion dollar corporations, the Zyngas and stuff, which can probably put 10 times the amount into marketing that they put into the product itself." "When I say they sold poorly, I mean we didn't make up the cost of the $100 license that was required to release on the app store," Kenny said. Teddy said they weren't bad games, but they sorely missed the word-of-mouth advertising that Flash games receive. So the players weren't spreading the word about the games, and Kenny said they had a hard time getting the press' attention, too. "Even though we started on the iPhone relatively early, like only a year into the App Store's launch, by then there were already tons of games coming out," Kenny said. "The competition was really pretty stiff." The modest developer's license fee and hands-off approach to gatekeeping might make mobile seem like an enticing market friendly to indie developers, but Teddy said the odds are stacked heavily against the small teams. "I think mobile is mainly geared toward the multimillion dollar corporations, the Zyngas and stuff, which can probably put 10 times the amount into marketing that they put into the product itself," Teddy said. "I know there are a couple games like Flappy Bird or Threes which become successful, but even in those cases, it feels like a majority of the time, because they're so simple, you're just going to get ripped off and somebody else is going to make the money you needed. So we're not really interested in the mobile industry anymore." But are the alternatives really any less geared toward huge publishers? "I don't feel like it's like that in the console space, but I do feel like the PC space is slowly going toward that direction, and I hope it doesn't," Teddy said. After the mobile missteps, the brothers went back to the PC and Flash-based games. That worked well for a couple years, until Armor Games' Kingdom Rush launched and changed people's expectations for Flash titles. "The standard for quality of that game was like three times higher than what was the current best Flash game ever made," Teddy said. "We had just released our last big game only a few days before that game came out, and when Kingdom Rush came out, it was like a funnel effect. Everybody on the Internet played that game, and we were like, we can't compete. This is setting a bar. In any industry, everything just keeps going up in quality. But that was at a point where we said, 'That's an impossible barrier for us to surpass. We can't compete. We have to go into a new space.'" 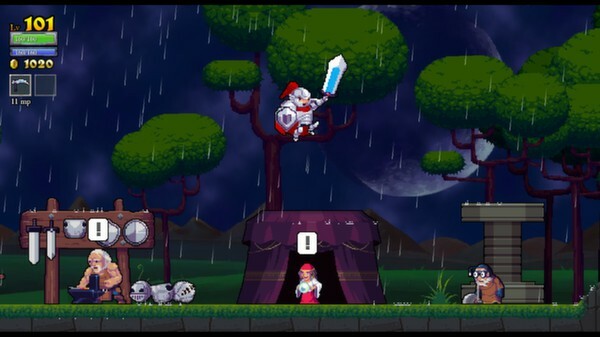 Rogue Legacy hits Sony platforms later this summer. That would be the downloadable PC space dominated by the Steam storefront. The brothers who couldn't make back their App Store developer's license fee, who couldn't compete with the skyrocketing expectations of Flash games, decided their best play was to make their biggest game yet, and to put it up on the same store where massive publishers like Activision and Ubisoft release their latest and greatest. While they knew they'd be going up against a field including multimillion dollar corporations this time around, Kenny said their App Store experience was not particularly beneficial. "It was the Flash games that gave us the confidence and the experience," Kenny said. "Sure, they're tiny games. And some of them take one month to make, some take three and a half months to make. But just the understanding of making a game from start to finish and everything that's involved with game development really prepared us for the PC market. Rogue Legacy took a year and a half to make, so it was significantly longer than our normal game. But for the most part, we knew we could do it, because we had done it five times before. That's a really important skill to have and it's really important for your confidence. Experience was the most important thing there." "The problem with this open-ended curation is the whole point of indie games is hopefully to reduce the need for promoting it...You want the game to sell on the laurels of the game itself." Rogue Legacy launched on Steam last June and was an instant hit, selling 100,000 copies within a week of launch. The next week, Sony reached out to Cellar Door and started talks to bring the game to PlayStation platforms. It is currently set to launch late this summer on PS3, PS4, and PS Vita. That success aside, the brothers still have some reservations about how Steam is evolving, specifically that it might be running into the same problems as mobile as Valve relaxes its curation efforts. Teddy was particularly concerned about the number of games launched on Steam that simply haven't worked properly, as well as successful games spawning too many me-too titles. "Goat Simulator came out and the moment it came out, it does super well," Teddy said. "Then out comes another simulator game, which I won't name, and I'm sure there are five more simulator games coming out, and each one is going to be slowly dropping the price. That's why the PC market, if it's not curated, is going to become the way of the App Store." Valve is attempting to change its curation process to put that power in the hands of its users, but its first steps in that direction have been problematic. The Steam Greenlight process was intended to let users vote on which games should be allowed on the store, but it drew frequent criticisms, and Valve has said it will soon drop the system altogether. "Greenlight, in my opinion, was not a system that was working as intended," Kenny said. "The problem with this open-ended curation is the whole point of indie games is hopefully to reduce the need for promoting it, for marketing," Kenny said. "You want the game to sell on the laurels of the game itself. But if you can't even get people to know that the game exists, that's a problem, and a lot of indie developers don't really have the budget for that sort of marketing." Though Steam has its issues, Teddy isn't in a hurry to see its grip on the PC market broken. "Monopolies are never good," Teddy said, "but I actually don't mind Steam's monopoly." To which Kenny replied, "You tell us this now because we're on Steam and have an account manager so if we want to get something on Steam now, it's much easier for us. So for us, it's fantastic. But before we released Rogue Legacy, before we had any visibility, I'm sure our answer would have been very different." "Monopolies are never good, but I actually don't mind Steam's monopoly." That speaks to some of Kenny's apprehension about the future of the indie development scene, specifically the problems of standing out and getting attention in a growing field. He seems concerned both about the number of people entering the field, as well as their motivations. "The quality of indie games is very high, but I feel like the quality of the ideas isn't. A lot of people are jumping into this, and this is just my opinion, but they're jumping into this to get rich, not to really make a good game, per se," Kenny said. Despite that, Kenny said it's great to see the success of indie games of late, even if it means tougher competition and an influx of talent raising the bar for everyone. Unfortunately, that influx brings a familiar problem, and one for which Kenny admits he doesn't have an easy solution. "With so many people picking up Unity, with every bad game that comes out, it's harder for people to find the good game, because there's just so much more to sift through," Kenny said. "That's my big concern." Teddy is more worried about a potential downside tied to the influx of new developers seeking indie success. "I think plagiarism is going to become a huge problem in the near future," he said. "Those small indie games--like maybe it takes them a month but it's still a really good idea--those won't be viable anymore, because it's going to be made, and then it's going to be ripped in like a week. And it'll be like the iOS market, where they won't have the money to advertise their product and it'll be the ripoff that comes a week later that takes all the profits. That's my fear." Steam is not a monopoly, not even close. Its just currently the preferred distribution point for many gamers. This is due to a combination of Steam being a nice distribution site, and gamers being lazy . There are all kinds of ways to distribute your game, the problem is that is cost money to market to the masses. But lets stop with this monopoly nonsense; " A monopoly is the exclusive possession or control of the supply or trade in a commodity or service." This is not even close to being true about PC games and game distribution and Steam. One word: marketing. The art of tricking people into buying something they don't need/want. Enough advertisement and sponsored media fuzz and customer prospects won't even notice anything else but your product. Indies can only dream about such campaigns, which IMAO is unfair market practice and corporations should be fined by market regulators. And if you can't sell anymore because of conscious consumerism, all you need to do is use your money to gain exclusive control over distribution channels. Which also is unfair market practice and corporations should be fined for continuing disturbance of demand-supply mechanism which is the foundation of free-market economy. And since nowadays supply more and more determines demand -- I think we no longer live in a free-market world. That is, until indies band up altogether and create a common distribution platform + contribute to its popularity through marketing. Ehh... If a Tetris clone and some simple number game fail on App Store, it is quite far fetched to make claims like "mobile is unfriendly to indies". There have been, is and will be many indies making milllions in mobile. Few examples just from Finland: Rovio, Supercell, Fingersoft, Frogmind, Cornfox & Bros. The description of their two app store games sound far from orginal! On a store filled to saturation with game clones you need a game concept that's unique and stands aside from the crowd. This is a 'rant' of someone who just can't make it.. PC and Mobile are really as open as it can be, but with everything, you have to come up with something special that stands out before you can achieve a high ammount of sales.. Surely if anything, PC and mobile are the two of the better platforms for indies? "Greenlght, in my opinion, was not a system that was working as intended," Kenny said. Fixed, Kingman. Thanks for the heads up. The description of their two app store games sound far from orginal! I think that was their point. Their games didn't do well until they had an original idea. Are they seriously going to claim that closed platforms that are *actually* owned by big corporations, which are also manufacturers and have the very last word on what can be published or not on their hardware, are more open and "indie-friendly" than mobile and PC? Sounds like some sort of convolute, baseless attempt to rationalize their subjective, biased fondness for consoles. Especially considering how, unless I missed some big part of this story, they don't have any data backing their claim. "Greenlight, in my opinion, was not a system that was working as intended," Kenny said. "The problem with this open-ended curation is the whole point of indie games is hopefully to reduce the need for promoting it, for marketing,"
No, it's not. The "point of open-ended curation" is to let the customers decide what they want available to buy, not to let every single developer score an easy hit. Exactly. I wonder how the editors pick these persons they give forum to rant about whatever? I bet everyone on these comments also have strong opinions about one thing or another, but they are hardly news. This just sounds like unrealistic entitlement to me. These virtual stores are pretty much exactly like supermarkets, you use these stores to have your product put in a place where everyone goes to get products of that nature, you're not paying the store to make your product a success, that's what you pay marketing companies for. This is the equivalent of a company making standard plain digestive biscuits, getting them put in Tesco, and then saying that Tesco is unfriendly to small biscuit manufacturers because their biscuits didn't sell. Discounting there view of why, I happen to know you can buy space on the front store for apps and it does translate into dollars if the game is fun. If the game is not fun nothing is going to help you. Word of mouth will kill the game eventually. What I think most developers don't understand is how to monetize the mobile games. The ones that make the most money are the ones that were designed to be fun while tricking you into spending money you did not plan on it. I was beta tester for Zynga games and worked for Disney Interactive dealing with mobile and console stuff before the restructuring. I worked with QA, the Developers, and various other groups to track down and fix issues. I had more fun knowing that most of the people on my team had no idea who I was working for in the company. So I got see how marketing laid out plans, how CS dealt with slips and and how the developers at the studios worked on identifying what was wrong. I was friends with some of the artists and some of the accountants so I had to limit my contact with their work. Then I got laid off by new management had to do so with a straight face. So I can say with out a doubt if you do not have the backing or ip at this point you will fight to be seen, so unless your app is seen through some other outlet, or gets lucky and makes a lot of money as an indie you are better off in other markets. I think indies actually have a better time now as games are getting brought over to the consoles as digital games that have shown to make money. So build a cheap simple game using something like unity or UE4, and as long as it is fun they have a shot at making money. The trick is to remember the execution is more important than the idea. If you want it to look cool and push that it is going to be compared other games that look cool. If you design something that looks simple but it is fun you need to push the fun because you can always go back and make a cool version but you can not go back and make a fun version. Hi~I'm a editor of MeFun media which specializing in game industry news . I know your game in App Store.It brought me a lot of fun. At that time Chillingo is the publisher. Be a editor i have so many questions for your Kukouri Mobile Entertainment. If you want contact me and learn some Chinese mobile stuff.